Welcome to my shop, Officer’s Apothecary! I sell a range of handmade artisan soaps, all handmade by myself here in my workshop in Scotland. My soaps are perfect as a treat for yourself, or for somebody else! Hi everyone and welcome to Officer’s Apothecary on Etsy! My name is Carly, and I’m the owner and sole creator here. I make all the artisan soaps you see in the shop by hand in my dedicated workshop using the traditional cold process method. I only use high quality oils and butters (always palm and animal fat free) sourced here in Scotland, as well as adding in exciting colours, fragrances, or beneficial ingredients I think you would love. It all started for me as a hobby a number of years ago, and after steadily growing my hobby I made the decision to leave full time employment and start my own business doing what I loved- making soap! My past experience has enabled me to learn the properties and behaviours of soap, the beneficial qualities of the raw ingredients, and how to design and craft the best bars of artisan soap I can. 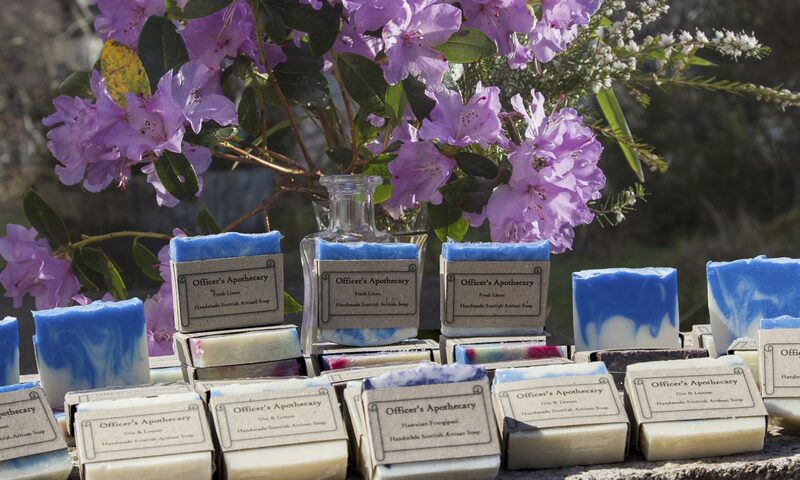 All my soaps have been tested by a trusted chartered chemist and awarded their safety certifications, so when purchasing from Officer’s Apothecary you can be confident in the quality and safety of your new soap. To best care for your handmade soap, you should store it on a soap rack or dish that drains well. This allows your soap to dry off between uses and therefore last even longer! Do you use Palm Oil in your soaps? No- my soaps are completely palm oil free, and always will be.